2018 was an interesting year for Canada-based Comstock Metals Ltd. (CSL:TSX.V) as it appointed Steven Goldman as interim CEO, completed an equity investment (and joint venture agreement) with E3 Metals (ETMC.V),while it also completed a drill program at the Preview SW gold project in Saskatchewan, where assay results are still pending. Last year, Comstock started to focus on battery metals (specifically lithium and cobalt) in its corporate strategy, instead of solely focusing on its gold projects at QV (Yukon) and Preview SW (Saskatchewan) in Canada. It entered into an option agreement in April to acquire 100% of the Rawhide cobalt-silver property in Ontario’s Cobalt camp, which has a total historical production of in excess of half a billion ounces of silver, as well as almost 30 million pounds of cobalt. While the amount of cobalt found in the camp may at first glance appear to be low, it’s important to know the miners were mainly looking for the silver and not for cobalt. The Rawhide property is an early stage exploration project, but the property has already been the subject of sampling and trenching programs. Previous operators completed 650 meters of drilling in the 1950s and 1960s in relatively shallow holes (the average depth was less than 50 meters), and encountered some high-grade silver, copper and cobalt assays. Interesting enough for Comstock Metals to follow up on these historical drill results with a surface exploration program, which returned interesting values for cobalt, copper and silver. In July, Comstock closed a CA$0.6 million private placement after issuing 12.15 million units priced at CA$0.05 per unit, with each unit consisting of one common share in Comstock as well as a full warrant allowing a warrant holder to buy an additional share of Comstock at CA$0.10 by July 3, 2020. $400,000 of the proceeds of this placement was immediately re-invested in E3 Metals whereby Comstock acquired 1 million units at CA$0.40. Each unit in E3 Metals consisted of 1 common share and a full warrant with a current exercise price of CA$0.60 and expiring in August 2019. As part of the arrangement with E3 Metals, Steven Goldman joined E3 as a strategic advisor. We will discuss the investment rationale for Comstock’s investment later in this report. And finally, on December 3, Comstock announced that it sold two non-core properties. The Old Cabin gold project in Ontario was sold for almost CA$100,000 in cash, while Fresnillo PLC (FRES.L) exercised its option to purchase the Corona project in Mexico in which Comstock had an interest. Comstock received approximately CA$215,000 in cash for selling its 50% stake in the Mexican Corona property. On top of that, Comstock retains a 0.5% Net Smelter Royalty at Corona. Reducing the amount of properties to focus on the core properties usually is a good move. One of those Tier 1 assets is the Preview SW gold project in Saskatchewan. Last month Comstock completed a drill program at the north zone of Preview SW, where it was planning to follow up on its exploration program conducted in 2017 on the northern end of the mineralization. Last month’s drill program was designed to test the down-plunge extension of the gold-bearing veins in the northeast structural trend North Zone, which was explored during the summer and fall of 2017. The results from the fall 2017 drilling program included 17.98 g/t Au over 5.71m starting at 10m below surface, 5.96 g/t Au over 5.66m starting at 19m below surface and, 1.88 g/t Au over 21.26m starting at 29m below surface. The North Zone is located just a couple of kilometers north of the current resource at Preview SW (158,300 ounces at 1.89 g/t in the indicated resource and 270,800 ounces at 1.48 g/t in the inferred category). Drilling in North Zone has been completed, and the assay results should be out soon. The company has also signed a definitive agreement with Yukon-focused White Gold Corp (WGO.V) to sell its QV gold property. White Gold will pay CA$375,000 in cash and issue 1.5 million new shares to Comstock Metals, which gives this deal a total value of approximately CA$2.6 million using a share price of CA$1.5 per share for White Gold. On top of the cash and stock payment, Comstock Metals will also receive 375,000 warrants with an exercise price of CA$1.50, which could be exercised during three years. Completing the sale of QV means this is the third asset Comstock has been selling in the past few weeks and months. The company is now solely focusing on its Preview SW gold project in Saskatchewan (where we hope to see some assay results in the next few weeks), and the early-stage Rawhide Cobalt-Silver project in Ontario. 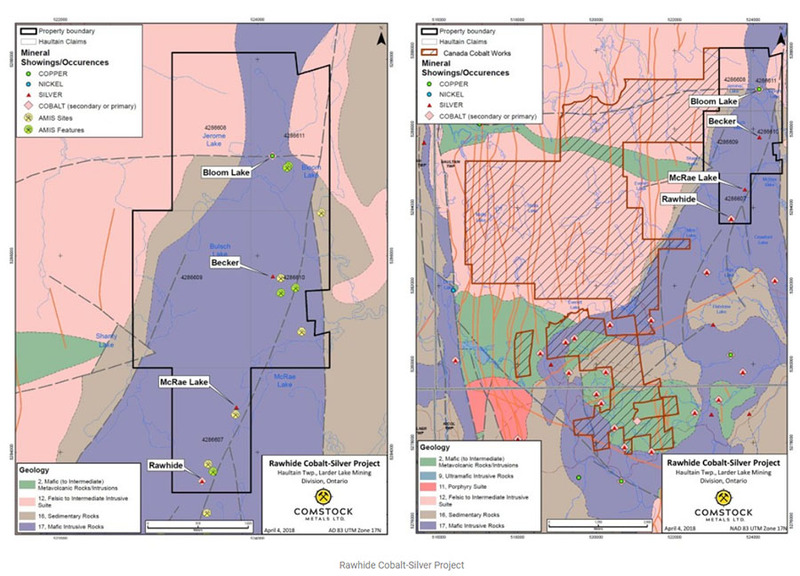 The CA$375,000 cash inflow will help Comstock to fund its potential work programs on both Preview and Rawhide, while the 1.5 million shares of White Gold still give it some exposure to exploration successes in the greater White Gold District, as this will undoubtedly remain one of the hotter districts in the Territory. The CA$2.6 million the project has been valued at what seems to be a fair price for an early-stage gold exploration project with a current resource estimate of 230,000 ounces. Some were disappointed to see the Yukon project go as the entire region seems to attract new attention every once in a while, but we think Comstock’s management felt it would be getting the best returns per exploration dollar spent on the more southern projects where the exploration costs are lower. Comstock Metals hasn’t determined a final exploration budget for 2019 yet as it’s waiting for a few updates (and the results from the Preview SW winter drill program) before deciding on its work programs in 2019. Now the QV project has been sold, Comstock’s management team now has to allocate exploration funding to just two projects. At Preview SW, the drill results from the December 2018 drill program should come in later this month or early February, and will help decide Comstock Metals’ next steps. On December 23, Comstock received a three-year exploration permit for the Rawhideproject. Comstock has also been in discussions with the local First Nations to make sure they are being kept in the loop and to discuss any potential concerns to make sure both First Nations are on board. Comstock could design additional exploration programs and perhaps a maiden drill program at Rawhide to be conducted later in 2019. Any potential drill program obviously depends on the company having enough cash on hand, but after the recent sales of the non-core properties and the QV Gold project, Comstock Metals is in a pretty good shape. We were a bit surprised to see Comstock Metals making an equity investment in E3 Metals last summer as it’s a bit unconventional for a pure exploration company to spend money on stock positions in other companies. That being said, we interpret this move to be a part of Comstock’s push into battery metals. It owns a cobalt project (Rawhide) and the equity stake in E3 Metals now also gives it exposure to the lithium sector. 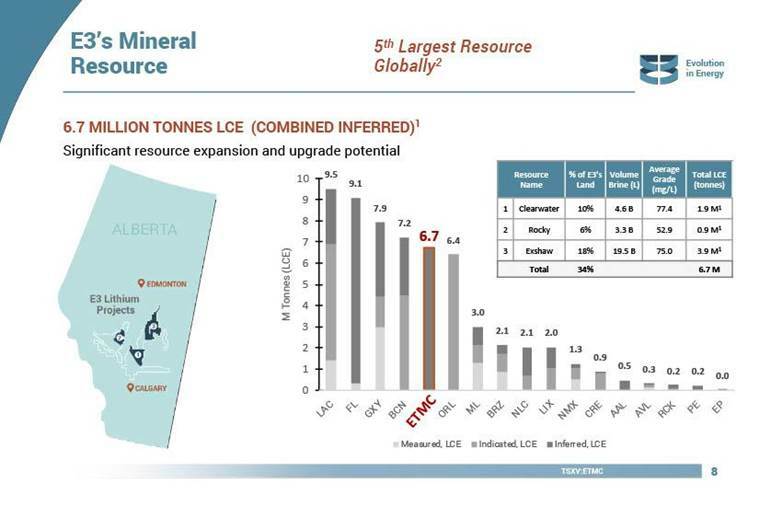 E3 Metals has been advancing its large petrolithium project in Alberta’s Leduc Reservoir where it has outlined a total lithium carbonate equivalent resource of 6.7 million tonnes based on three separate NI 43-101 reports, making it one of the largest lithium projects out there. 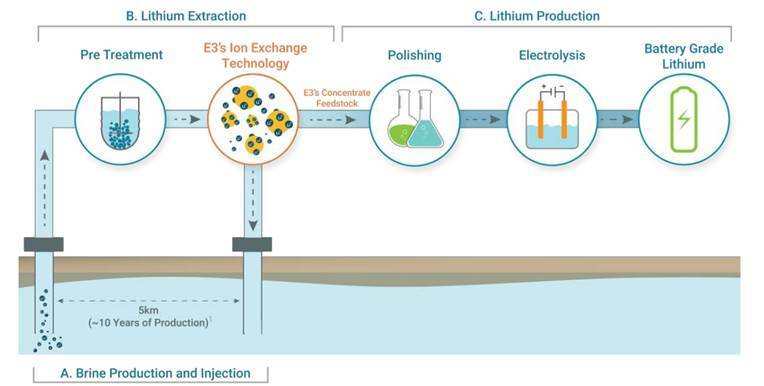 In December, E3 Metals released an important update on its proprietary petrolithium extraction and concentration technology after completing four test runs at its laboratory testing facility. The average grade of the petrolithium brine in the Leduc Reservoir is usually very low (72 mg/L for the brine used in E3’s test work, which is substantially lower than lithium-bearing brines in, for instance, Argentina or Chile) so increasing the average grade was a vital part of the plan to end up with a viable petrolithium project in Alberta as an evaporation pond is totally out of the question. E3’s lab test results actually exceeded our initial expectations considering the average lithium recoveries were 90%, while the lithium content increased by an average of 1700% (!) to 1308 mg/L. These were just the averages, and E3 Metals has also been able to demonstrate a recovery of up to 99% while reducing the volumes by 20 times to end up with a final grade of 1498 mg/L, indicating the average outcome could still be improved after additional testing. And in the process, the ion-exchange sorbent removed 99% of the impurities, which also is an important factor for potential offtake parties. This is a major step forward for E3 Metals (and Comstock Metals) as increasing the lithium grade is a key component of defining the economic viability of the project. The higher the grade, the cheaper the potential extraction and the lower production cost per tonne of LCE. And although the share price of E3 Metals has dropped by approximately 20% since Comstock Metals acquired its 1 million shares, we do feel E3 has been making major steps forward. Comstock Metals has now streamlined its asset portfolio and monetized two non-core exploration properties as well as the QV gold project in Canada’s Yukon Territory. This allowed CSL to increase its cash position and to focus on its two remaining core mining projects: Rawhide (cobalt/silver) in Ontario and Preview SW (gold) in Saskatchewan. It also still has its joint venture with and investment in E3 Metals (petrolithium). Comstock is now waiting for the drilling results from last month’s drilling program at its Preview SW gold project in Saskatchewan, and those assay results should be out soon. Seeing a small exploration-stage company like Comstock making an investment in another junior in the lithium space was an interesting move. We admit that at first, we weren’t fully convinced about this decision, but the potential upside available on E3’s potential enormous petrolithium resource, together with the recently published lab results of its proprietary extraction and concentration technology process to “upgrade” the average lithium grade in the petrolithium-brine have reduced our concerns a bit. Now it’s up to E3 Metals to advance its proprietary technology to ensure the Alberta-based petrolithium brines can compete with the low-cost brine production in Argentina and Chile. 2019 should be an exciting year for both E3 Metals and Comstock. 1) Thibaut Lepouttre: I, or members of my immediate household or family, own securities of the following companies mentioned in this article: a long position in Comstock Metals. My company has a financial relationship with the following companies referred to in this article: Comstock Metals. I determined which companies would be included in this article based on my research and understanding of the sector. Additional disclosures are below.